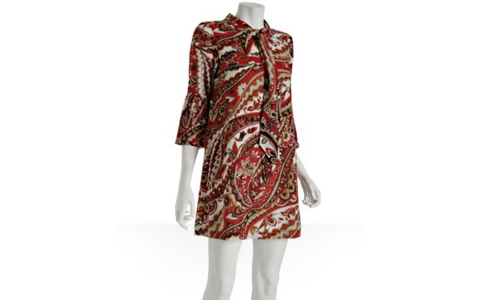 Psychedelic prints are a staple of the 1960s, from Twiggy’s own line to Biba and beyond. Carrying off a busy print and bright colours together can often be difficult, but this Tibi mini shift dress has the balance down pat. With a colour palette of reds against white, this paisley print manages to be bright and firmly rooted in a sixties feel without being blinding. The more muted approach avoids a cartoonish retro feel, too. In a simple shift, with a short hem and high cut collar, the final product stands up next to its true vintage counterparts. It’s available online from Blue Fly for $230.